The Midland Street Entertainment District bar owners are proud to present The Second Annual Santa Claus for the Cause fundraiser Thursday, Dec. 17 at 5 p.m.
Only 1,500 suits are being sold and are on sale now at participating bars and restaurants for $10! Santa Suits include a hat, beard, coat belt and pants. Proceeds from the suit sales will be split between individual bars and their charities. Each suit also includes a raffle ticket with a prize of up to $1,000 going to the lucky winner. Only 1,500 suits are being sold. Stables Martini & Cigar Bar, 804 E. Midland St. - Crime Stoppers. On the day of the event, each establishment will offer drink specials, raffles, auctions and games to help raise funds for the charities. 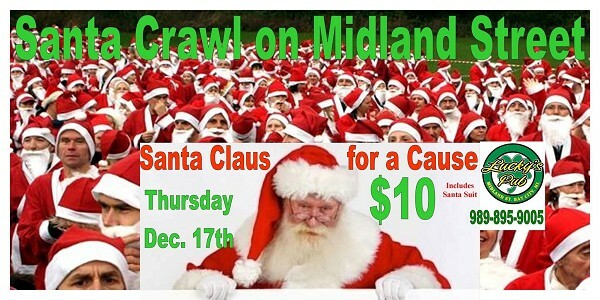 Midland Street will be blocked off at 9 p.m., allowing the Santas to gather for a group photo and group sing alongs. The Rathskeller Food & Spirits & Knights Of Columbus Council 414 - Bay City, MI, Grand Total is $4696.00 $1920 in snowflakes $1025 for the live auction $1751 postcard and cash collected.